The BEKYA store is re-launching on Tuesday 30th April between 11am & 3pm! Located in Liverpool Lane of World Square. We are closed Good Friday and Easter Monday. Open on Easter Saturday and Easter Sunday as per normal. We are closed Good Friday and open normal trading hours from 11am to 10pm over the Easter period. Join us at Bekya for a Middle Eastern banquet with a glass of sparkling wine on arrival, before watching the race on the big screens in the Tramsheds. Roll on up and learn how to create Sambousek, a middle eastern-style empanada – from dough to done. Bekya’s crew will show you the way and you can take the finished product home to cook and share. Learn how to make Sambousek, a Middle Eastern version of Latin American empanadas, tiny turnovers of buttery flaky dough enveloping a flavor burst of savory or sweet filling on the inside. The class will run from 9.30am for 1-1.5hr. 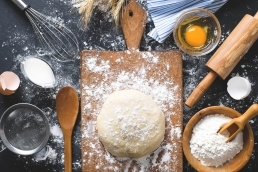 You will be shown how to make the dough, fill it with a sweet and a savoury filling. You will get to take your uncooked pastry home to cook. 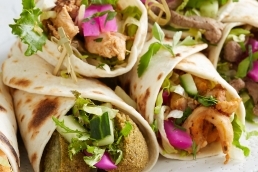 After the class you will enjoy a traditional middle eastern breakfast with a coffee or tea. Fee charged is for class and breakfast. Class runs for approx 1.5hr then followed by breakfast.